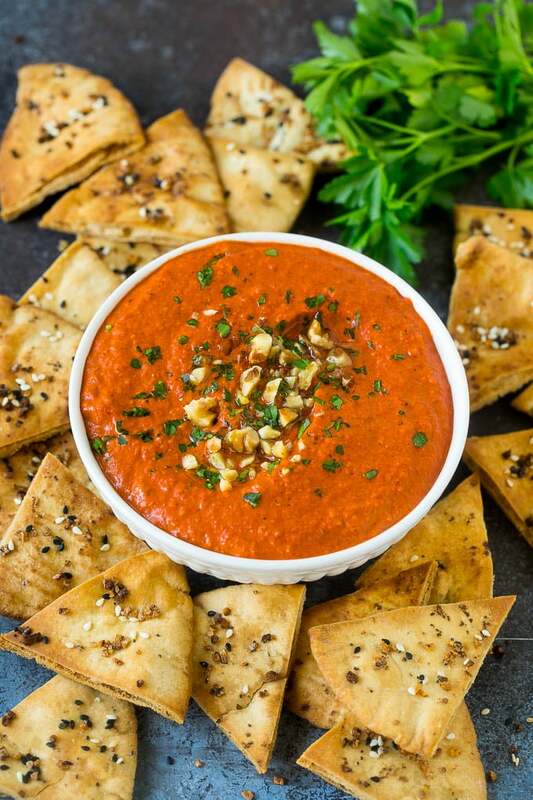 This muhammara recipe is a creamy roasted red pepper and walnut dip that’s full of flavor. Serve it with pita chips or vegetables for an easy yet unexpected make-ahead appetizer. 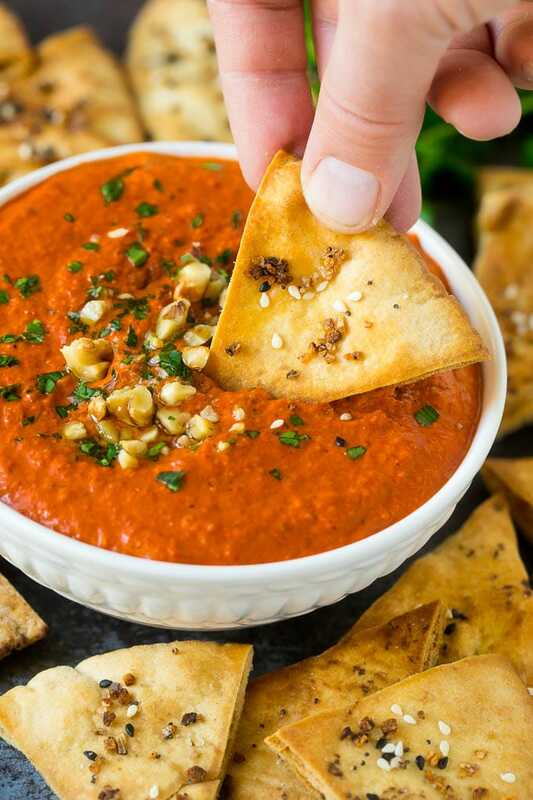 I’m always looking for new dip ideas to serve at parties – some recent hits have been dill pickle dip, crab dip, and this Middle Eastern red pepper dip. It always gets rave reviews! When I’m entertaining, I’m always looking for snack options that I can make in advance. 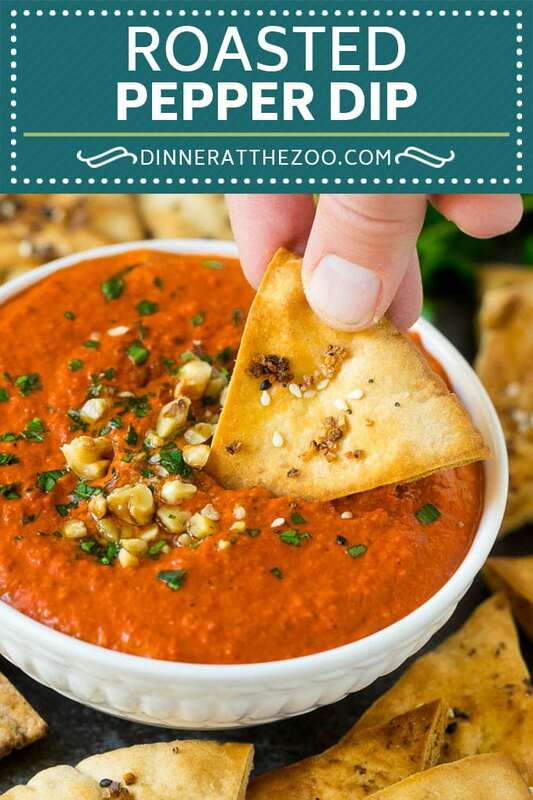 This muhammara dip is the perfect solution, as it can be made up to 3 days in advance and is a super unique offering. Once you try it, you won’t be able to stop eating it! Muhammara is a Middle Eastern dip made with roasted peppers, breadcrumbs, olive oil, spices and walnuts, and let me tell you, it’s TOTALLY delicious! Think along the lines of hummus, but much creamier and with roasted peppers instead of chickpeas. How do you make muhammara? 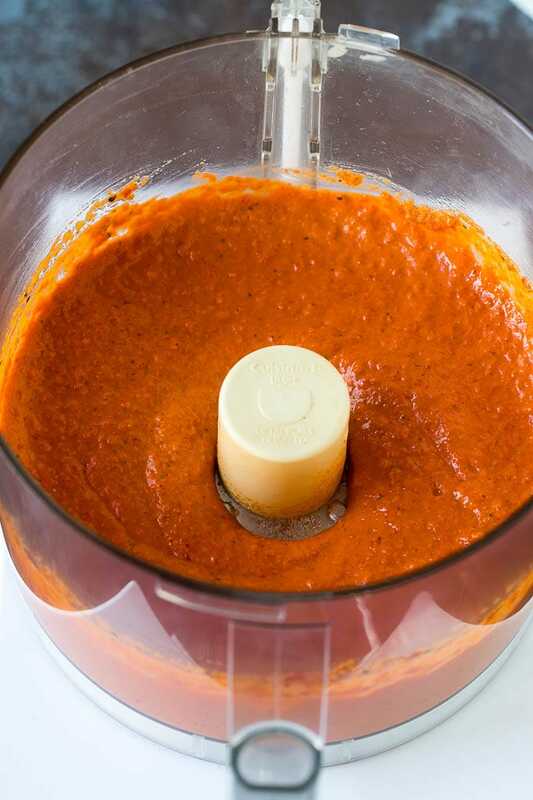 This muhammara recipe is super simple to make – all you do is throw everything in the food processor, blend and serve! If you don’t have a food processor, a blender will also work just fine. How do you roast bell peppers? You can roast your own bell peppers or use the jarred kind. If you want to roast your own, simply halve, seed and core 3 peppers, place them on a baking sheet lined with foil and broil for about 10-15 minutes or until the skins have blackened. After they come out of the oven, cover the top of the pan with foil for another 5-10 minutes, then peel the skins off and you’re ready to go! Most of the ingredients in this dip are pretty basic except for one: the pomegranate molasses. Pomegranate molasses can be found in the ethnic aisle of grocery stores, and it’s a traditional addition to this dip. But to be honest, I’ve omitted the pomegranate molasses before and it’s just as delicious without it, so if you can’t find it, just omit it! 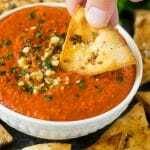 I’ve made this dip both with store bought roasted peppers and homemade roasted peppers, and it’s great either way. So if you don’t have time to roast your own peppers, don’t worry about it. You can serve this dip with pita chips, flatbread, fresh vegetables, crackers, there are so many different options. Muhammara is also great as a sandwich spread, drizzled over pasta or served on a salad. How do you make pita chips? My favorite way to serve this dip is with homemade pita chips. To make pita chips, preheat your oven to 400 degrees F, and coat a sheet pan with cooking spray. Cut 4 pita rounds into 8 wedges each, then lay the wedges in a single layer on the pan. Brush the pita wedges with 1/3 cup olive oil and sprinkle on any seasonings you like (I used everything bagel seasoning here). Bake for 10-12 minutes or until browned and crispy. Once you try this dip, you’ll find yourself making it on a regular basis! It’s great to have on hand for a quick snack, and it’s on the healthier side too which is always a bonus! Who needs hummus when you can have muhammara instead? 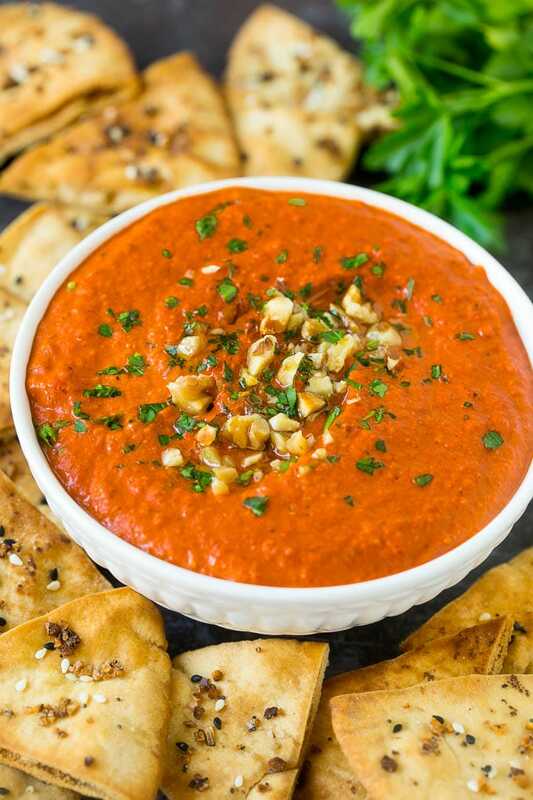 This muhammara recipe is a creamy roasted red pepper and walnut dip that's full of flavor. Serve it with pita chips or vegetables for an easy yet unexpected make-ahead appetizer. 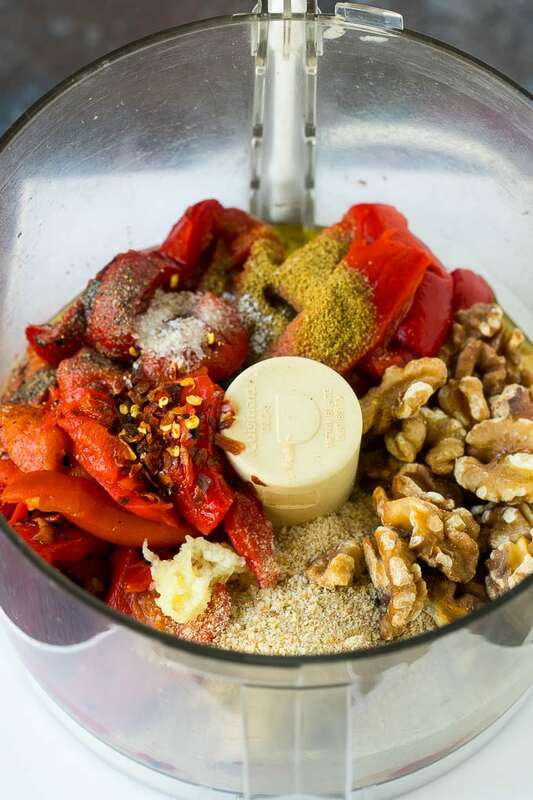 Place the roasted peppers, walnuts, breadcrumbs, garlic, lemon juice, pomegranate molasses, cumin and red pepper flakes in the bowl of a food processor. Process until combined. With the motor running, gradually add the oil until the mixture is smooth. If desired, top with a drizzle of olive oil, walnuts and parsley. Serve with pita chips. Have you frozen this? I have a ton of peppers to use up and would love to make a huge batch! I haven’t frozen it before, I think it might work although it might be a little thinner in consistency after you thaw it. This is so good, thank you for the recipe! I would like to make it gluten-free for a family gathering. Do you have any suggestions on how to substitute the bread crumbs if I don’t want to use gluten-free bread crumbs? Thanks again & greetings from Switzerland! You could try adding more walnuts in place of the breadcrumbs! This recipe is calling to me Sara – I love everything about it. The color, the flavors, the texture are all amazing. I have pomegranate molasses in my cupboard – yeah! Have a lovely day. I love this stuff possibly even more than I love hummus! I made my own pot molasses by reducing a cup of pot juice down to 2 Tablespoons. Took a few minutes but totally worth it for the ZING pot molasses brings! Great idea to make your own pom molasses, I’m definitely trying that next time! Whoa! I am excited about this dish! Walnuts and red pepper would be amazing together!